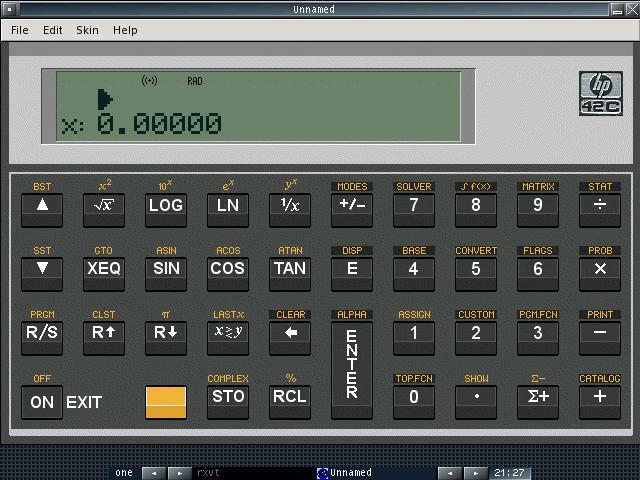 This is a Zaurus port of the Free42 HP-42S calculator/HP-82240 printer emulator for Unix/Linux + GTK. 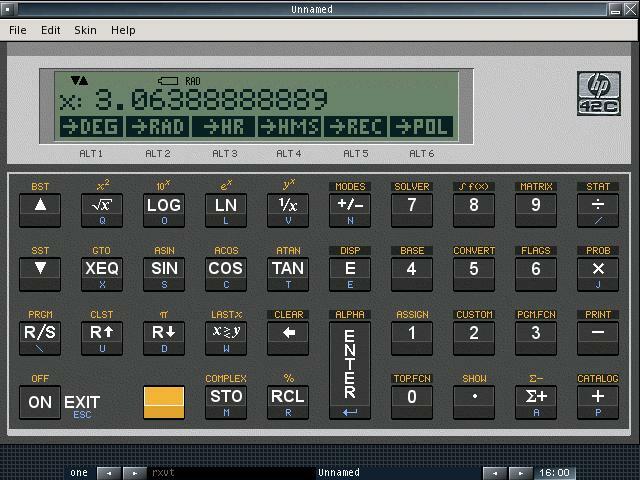 The HP-42S is arguably the best RPN calculator ever made (strong case can be make for the 15C and 41C as well, go to http://sense.net/zc/nonpareil for older RPN HPs). If you are interested in RPL then checkout http://sense.net/zc/x48. This port has only been tested with Cacko 1.23 on my c860 with X/Qt 1.9 for X11. More information about Cacko and X/Qt can be found at http://www.zaurususergroup.com. Download the free42 binary and save in /usr/local/bin (or any other directory in your PATH). Help support open software. Go to http://home.planet.nl/~demun000/thomas_projects/free42/ and donate today. Install xterm to run from the command line. 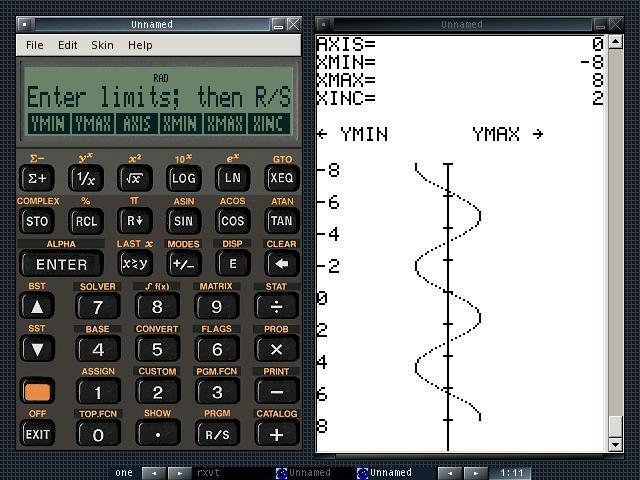 Download the free42 binary and save in /var/lib/install (or any other directory in your PATH). 42ck/42ct skins only. Normally the top 6 keys of a 42S do double duty as function keys for the menus. The 42ck and 42ct skins have the aforementioned keys moved to locations to better match the layout of a 15C. Although the "top keys" still perform this secondary function the locations are counterintuitive. This should not be an issue. For the 42ck use F1-F6 for the menus. For the 42ct just tap the menu in the LCD. What if HP put the logic and display of a 42S in the compact and convenient form factor of a 15C? You'd have the 42C. 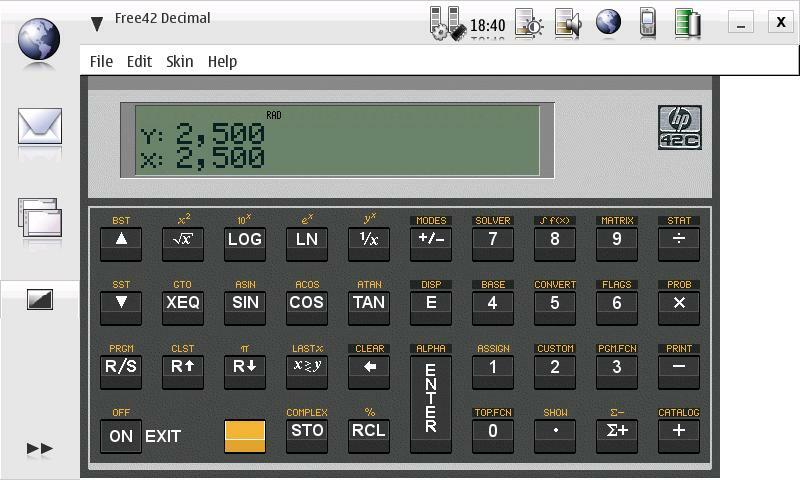 This skin (42ct, t for tablet) was specifically designed for the Zaurus 640x480 display. NOTE: When selecting 42S menus tap the virtual LCD screen. 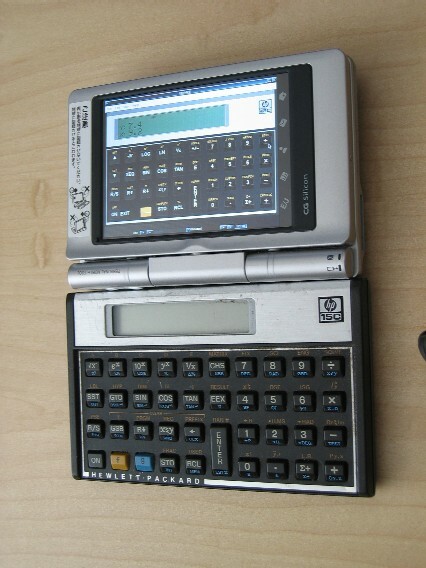 Below is a c860 with display rotated over keyboard. The power of the 42S in a 15C form factor. Free42 binary below supports the Nokia 770 Internet Tablet. The 42ck (k for keyboard) skin sports keyboard hints (in blue) so that navigation can be completely performed without the use of the stylus. Notice the low battery indicator. This will appear when the battery drops to 20%. Orthodox 42S users will prefer the native look and feel of a true classic. On the right is the output from the virtual HP 82240 printer. More printer output examples can be found here: http://home.planet.nl/~demun000/thomas_projects/free42/82240/index.html. Printer output can be saved as text or GIF. Use a stopwatch to time. If too fast, then run S10 and divide time by 10. Results (x: 2,500) and iterations (y: 2,499) reported on the stack. Ideally they should differ by one.